Alexander McQueen's skull clutches are cultish favorites among cutting edge fashionistas. Their combination of high class glamour and punk rock DIY spirit is irresistible. This Byzantine Queen Skull version of the clutch is the most ornate and opulent to date. The patent brown crocodile would have been an extraordinary touch of luxury all on its own, but Alexander McQueen didn't stop there. The entire front surface of the bag has been encrusted with a jeweled Byzantine pattern. This look may be a little much, but that's sort of the point. It's so much that you just can't help loving it. The Queen Skull uses the same hard case as the rest of the line, and its simplicity works perfectly here to showcase the fine details, such as the studded edging and over-the-top clasp. This is one of the most elaborate closing mechanisms that I've ever seen. The queen's ruby eyes and antique gold tone bring out all the sparkle of the Byzantine design. 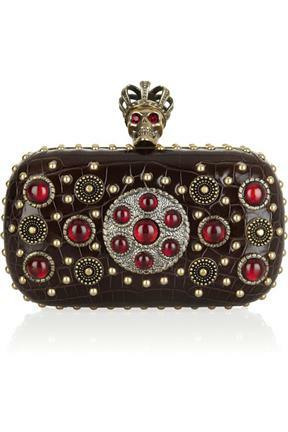 At $9,750, the Byzantine Queen Skull clutch is the priciest in the line. But price really isn't the point with a bag this decadent. You just can't get this level of luxury for much less. The Alexander Wang Tina bag, a fabulous alternative to this bag.